We asked Amanda a few questions last year that would help you get to know her better as a runner and as a #HogeyeHopeful. Thanks for chatting with us, Amanda! Unless you count running up and down a basketball court, I didn’t start running distances of any kind until my first summer at West Point – otherwise known as Beast Barracks. It was 12 weeks of dreading the next run because I was slowslowslow… I ran for the nine and a half total years I was in uniform and then upon becoming a civilian, told myself I was so lucky I’d never have to do that again. Famous last words. Because I was given a direct order!! Haha!! The second time around when it was my own choice, I had been a civilian for about a year and a half, working tons of hours and not working out at all. After a friend’s wedding I saw a picture of myself in a bridesmaid’s dress and thought, how did *that* happen? 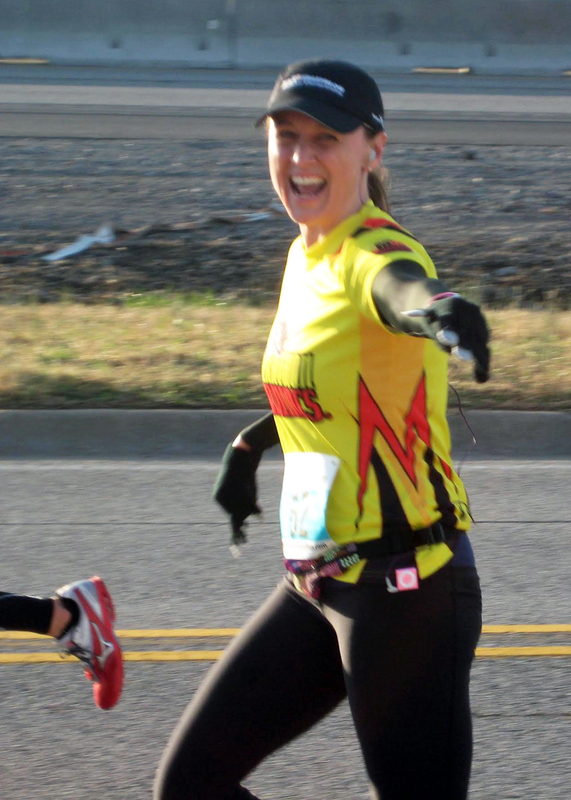 I signed up for my first marathon a few weeks later and completed the 2004 Marine Corps Marathon that fall. I took another several year hiatus when I had my kids but after moving to Fayetteville in 2011, I found my “sole mates” in my running group and have been a dedicated runner ever since. For my everyday runs, I love to run anywhere in Fayetteville – as long as it’s outside, I’m happy. Over the years, I’ve had the good fortune to run in a lot of places – it’s my favorite way to see a city when I travel – and while I love running in my hometown, nothing beats running at West Point, with the sun coming up over the Hudson River, or coming up the hill by the Cadet Chapel to see Michie Stadium reflected in the still waters of Lusk Reservoir. Have you run the Hogeye before? The 2015 Hogeye was my third Hogeye Full, and I’ve run the Hogeye Marathon relay once. To believe that your body can do this!! The human body is an amazing machine, and you can push it so much harder then you think. Don’t stop when it starts to hurt – the feeling of accomplishment after getting through a really tough workout is more rewarding than you can imagine. What has running taught you about yourself? Running has taught me that I’m better than average – I was surrounded by such amazing athletes all through college that I eventually decided I was average to below average when it came to anything fitness related. Since really becoming a RUNNER, though, I’ve learned that I have so much more within me than average when I put my mind to it. What motivates you in running? Medals? PRs? Fitness? I have several running-related goals that keep me going. I hope to qualify for Boston again someday but this time, actually get in!! I also want to run a marathon in all 50 States. On a smaller level, though, I run 1) for the bling; 2) to set a good example for my kids; 3) because I really, really, REALLY love Oreos, and 4) because I can!! Nope, nada. Not a superstitious kind of person. I’ll wear whatever strikes my fancy that day, eat whatever seems like a good idea that morning, and seem to find something new every time that makes it the best race yet. Why do you run the Hogeye? What makes it special? I run the Hogeye because it’s my hometown marathon!!! I am so blessed to live in NW Arkansas, and the Hogeye is an amazing tradition that is an important part of what makes NWA special. There’s something really special about being able to run a marathon on the pavement that I pound all year long, and to see my friends along the route either running with me, cheering for me, or as a volunteer ready to hand me some water or a gel. You can’t beat your hometown race! How can folks connect with you? I blog about random stuff, but running is a recurring theme (when I find time to blog, that is) – . I’m @themiddlekid on Twitter and frequently share my workout links so you can cheer me on or shake your head at my slight obsession. Thanks for sharing your story, Amanda! See ya out there!